Authors Martin Shapiro and Samuel Bozzette discuss how the inequities in HIV care demand remedies for U.S. health care and how quality deficiencies pervade the U.S. health care system. The review also examines the value of drug prevention programs as a means of solving the problems of substance abuse. 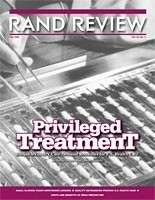 Shapiro, Martin F., Samuel A. Bozzette, and John P. Godges, RAND Review: Vol. 23, No. 2, Fall 1999. Santa Monica, CA: RAND Corporation, 1999. https://www.rand.org/pubs/corporate_pubs/CP22-1999-09.html.